Accepts and discharges 55 gallon steel drums of lithium hydroxide anhydrous powder. 72” discharge height, 28” reach. 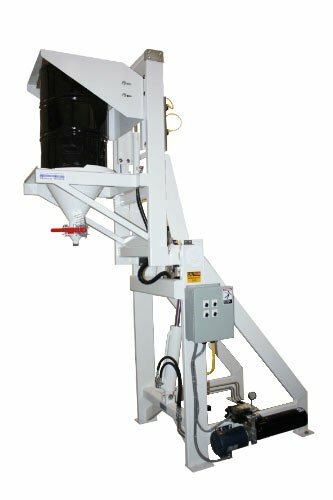 MTS hydraulic Lift & Seal™ system seals drum to pour cone inlet for dust-tight operation. Seal carriage features sealed cam rollers on a flat bar track for smooth, reliable operation. Rolled, mild carbon steel pour cone with dust-tight elastomer inlet seal. Pour cone includes a fully mounted 4” diameter manual butterfly valve with 1 1/2” NPT outlet. 3” diameter flange bearings on pivot. All rigid hydraulic lines are 304-2b stainless steel. Carbon steel cleaned, primed, then painted Dairy White epoxy. Unit is 55” wide x 55” deep x 73” high. Self-contained 2 GPM hydraulic system driven by 2 HP, 460v/3ph/60Hz TEFC motor. NEMA 12 momentary contact control station is pre-wired for simple operation. Installation requires only one (1) 460v/3ph/60Hz power drop to main control panel.